Posted on 7/10/2017 by Robert Leathem. 0 Comments. This informative webinar is presented by Rob Leathem, an SAP certified professional with 17 years of international ERP experience. Rob specializes in the SAP Financials & Controlling (FICO) modules. 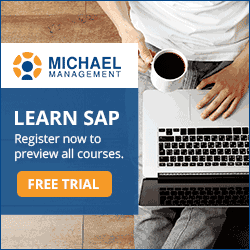 You may already have taken one of the SAP courses (locate Rob’s course/link) Rob created for Michael Management. In his courses, Rob makes use of his SAP career experience which has taken him all over the world and across multiple industries including high-tech, manufacturing, and media. You can also find SAP Product Costing – Planning and SAP Product Costing – Cost Object Controlling in our library of SAP training courses. Rob will discuss different methods to absorb overhead in standard product costing which is an essential part of costing. Often on a project you come across various decision sticking points or questions about how you should best apply overhead. There are scenarios in which you don’t want to apply overhead evenly to all products. This scenario arises when some products absorb more overhead than others and you may be struggling to decide how to differentiate different products in terms of how they absorb overhead. Are all products in the same clients getting the same rate and is this something you want? How do I selectively apply Overhead in this AP? How do I adjust for different products on the same production line? How do I manage master data complexity? If you have very simple rules applying a very standard overhead rate to all products, this process will be very simple. Once you get into more complex and varying different rates, you need to know how to effectively manage these different rates. You will also need to know what is the best way to schedule the varying rates. The SAP costing sheet in its simplest form may seem inflexible as to your needs. In this session, we will address some of the misconceptions and how-to options that are available to you. The presentation will ask you to make decisions about the best way to account for your products. How to apply percentage based overhead. How to apply different percentages rather than being stuck with one percentage across all products. How to use activity based overhead and not percentages. Learn how to use fixed amounts by piece or per hour. Rob provides a complete review of the anatomy of the costing sheet. He will discuss the three main elements: base, overhead, rate, and credit key. You will be taken through 3 main solution options with examples of each. Rob closes with an easy to follow summary to keep you on track when putting these great ideas into practice. How will you use what you learned today? Do you have any tips for working with costing? Leave us a comment below. SAP Professional with 16 years International ERP experience. Cross industry projects high tech, financial services, software, consumer products & manufacturing industries. Expert in SAP Financial systems design, configuration & implementation including ECC6, New General ledger, product costing, profitability analysis, material ledger, Intercompany processing, Tax/ VAT, US GAAP/IFRS. Exposure to SAP S4/HANA Finance roadmap design & SAP EPM / BPC. Will you be ready? Accounting for Asset Leases - the new way!